intellectual and developmental disabilities (I/DD). 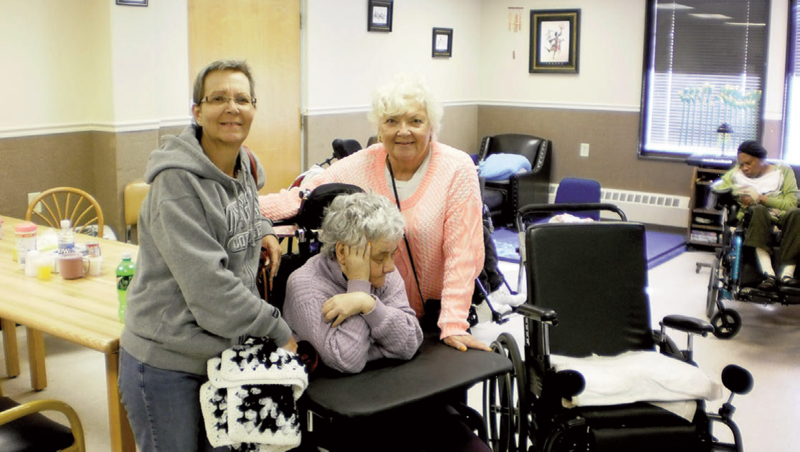 Located in Salisbury, Maryland on the State’s idyllic eastern shore, Holly offers a variety of services to individuals with significant disabilities. As a federally regulated Medicaid Intermediate Care Facility for Individuals with Intellectual Disabilities (ICF/IID), Holly Center is well-equipped to provide high quality, specialized care and compassionate supports uniquely tailored to individuals with profound care needs, including I/DD, medical complexities, physical disabilities, and behavioral challenges. Before her admission to Holly Center, Ginger did not always feel so at home. For many years, Ginger lived in a smaller home that struggled to meet her profound needs. Her stepmother and legal guardian, Mary Reese, however, never gave up. After a difficult eight year journey, Ginger was finally, truly home at Holly Center. a national advocacy organization (www.vor.net) to make the placement happen. Ginger’s long journey, while certainly peppered with significant hurdles along the way, is not without success that will benefit others. One early legal victory was the 2006 decision by the Maryland Court of Special Appeals ruling which stated that Ginger was denied due process when Maryland’s Secretary of the Department of Health and Mental Hygiene refused to even hear her request for admission to Holly Center. At issue was a statute controlling admissions for Medicaid Intermediate Care Facilities for Individuals with Intellectual Disabilities (ICFs/IID) in Maryland. The controlling statute was found unconstitutional because it only provided for a hearing when ICF/IID admission was approved. Reese, credits VOR, a national non-profit advocacy organization for recognizing that a victory for Ginger would benefit Ginger’s peers throughout Maryland. “VOR convinced the law firm Sidley Austin, LLP, that Ginger’s cause was a cause worth taking,” said Reese. “Thanks to VOR, we had access to outstanding legal representation and advocacy to carry this cause forward.” Sidley Austin attorneys provided pro bono representation to Ginger and Mary for more than six years. VOR is a national nonprofit membership organization advocating for high quality care and human rights for people with intellectual and developmental disabilities. Learn more at www.vor.net. and supports intended to assist each individual in reaching their maximum potential. Services are provided in an environment that is safe and healthy. A variety of services are provided including vocational, educational, medical, dental, physical therapy, occupational therapy, speech language, audiology, psychological, psychiatric, neurological, physiatry, dietary, recreational activities, respiratory and 24-hour nursing. These services are tailored to the unique needs of each individual by a team of professionals representing many specialties.